Just a heads up to check your email because I almost missed mine, if you are signed up for theHome Depot Garden Club then you should have received your recent newsletter. In the bottom right you will see a couple of coupons. 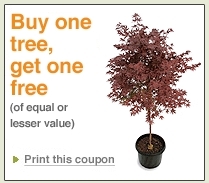 One of then is for a Buy One Get One Free tree. So if you were buying some trees this spring, make sure you grab your coupon.